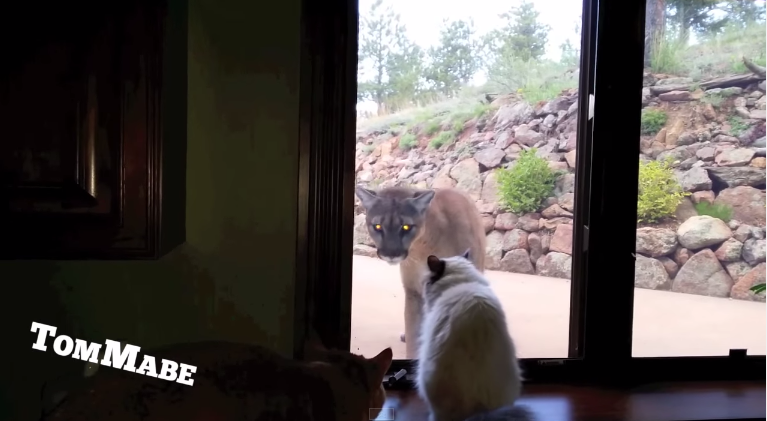 Strange Stand-Off: House Cat versus Mountain Lion - 2NGAW! Many of us would only get the chance to meet a mountain lion at the zoo but one family was lucky enough to enjoy an encounter with a real one from the wild just outside a friend’s home. Prankster Tom Mabe was visiting a friend at Boulder, Colorado when he chanced upon a strange stand-off between a mountain lion and a rather unimpressed house cat. While the angry mountain lion hissed at the cat in anger, perhaps because the glass prevented him from snacking on the smaller feline, the latter simply looked at it. Seemingly bored with what it is seeing, the house cat did not even give the mountain lion any indication that it was afraid or even angry. Perhaps this house cat was used to having mountain lions around! Still, it was fun to watch the house cat keeping its cool while the angry predator was hissing at the other side of the glass. As for cat number 2, it might be as unimpressed as the other cat with the mountain lion’s display of dominance but it kept a safe distance from the interaction.